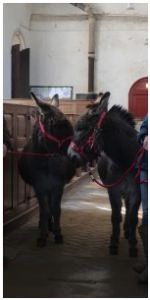 Palm Sunday with donkeys, Jimmy and Timmy. On a warm Spring afternoon in the depths of Norfolk countryside, Jimmy and Timmy led our congregation from Abbey Farm to St Mary’s in East Walton. Watching us from the chancel Jimmy had a quiet word with Timmy. A beautiful reminder of the welcome given to Jesus as he rode in majesty into Jerusalem. A wonderful way to start Holy Week in the Gayton, Grimston and Great Massingham benefice in West Norfolk.